JULY 3--What can a baseball fan learn from a series of e-mails exchanged by Roger Clemens and Brian McNamee, the trainer who has accused the baseball star of using performance-enhancing drugs? Well, Clemens can't spell the words 'douchebag' or 'lawsuits,' uses the word 'rocket' in his e-mail address, and signed electronic missives with his uniform number, 22. The e-mails, reproduced here, were sent in October 2006, following the publication of a Los Angeles Times story reporting that Clemens and teammate Andy Pettitte were identified as steroid users in a confidential federal affidavit (the Times story proved to be erroneous). 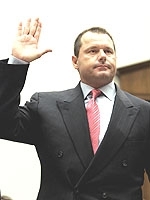 Though Clemens now claims that McNamee has wholly fabricated accounts of his steroid use, the athlete did not appear to bat an eye when his crony referred to being a 'rat' and 'flipping' on the baseball legend. A cynic might refer to that as evidence of guilt on the pitcher's part. Doggone Nice Mug Shot, Leona!